This 21 Chord Acoustic AutoharpStore.com Exclusive plays in eleven different keys and features a flame maple design with a natural high gloss. Note: This model no longer has a built in equalizer. "The AutoharpStore.com exclusive line of autoharps includes the beautiful Oscar Schmidt OS11021FHS and OS11021FHSE. These autoharps were only made once and are true collector's items. The OS11021FHS and OS11021FHSE feature flame maple on the front and on the back of the autoharps are solid spruce. The natural wood tones are accentuated by the honey sunburst design. The glossy finish of this instrument will help protect this instrument for years to come. One downside of glossy finish is that it will slightly dampen the acoustic sound of the instrument as the finish is thicker than satin finishes. Oscar Schmidt constructed these exclusive autoharps the same way they have been building them for years. Each autoharp features a frame made of rock maple and a 10-ply rock maple pin block. The 10-ply rock maple pin block helps prevent the tuning pegs from moving once you have tuned your autoharp. Both the OS11021FHS and OS11021FHSE feature sound cavities that are framed by maple and provide ample sound to play these autoharps acoustically. All of the exclusive AutoharpStore.com autoharps includes a fine tuning system. The fine tuning system will allow you to make small changes in the pitch of your instrument. These tuning adjustments will also help extend the life of the main tuning pegs. Since the main tuning pegs are placed in wood, there is a possibility that they can become loose over years of use. The fine tuning system will allow you to make some of the tuning adjustments and not have to turn the main tuning pegs. However, you should not do all of your tuning on the fine tuning system as they have a limited amount that they can be turned. Oscar Schmidt has been updating their line of 21 chord autoharps to better suit their customers. The chord bars now feature thicker felt that will help prevent the chord buttons from becoming flush with the chord bar cover. The chord bar cover now has foam padding underneath to help dampen any mechanical sound that the bars may make when hitting the cover. Currently, at the Autoharpstore.com we are including a 50% off gig bag with the purchase of any Oscar Schmidt Autoharp purchase. You can also choose from an instant $30 rebate off the purchase of either a semi-hard shell case or hardshell case. In addition to the 1/2 off gig back, we will include a free tuner with your purchase of an autoharp. There is also the option for a discounted digital tuner that has a built-in metronome and tone generator. We also offer $20 flat rate shipping in the continental US for any autoharp. Autoharpstore.com has a wide range of books that will help you get started with playing the autoharp and learning about the instrument. 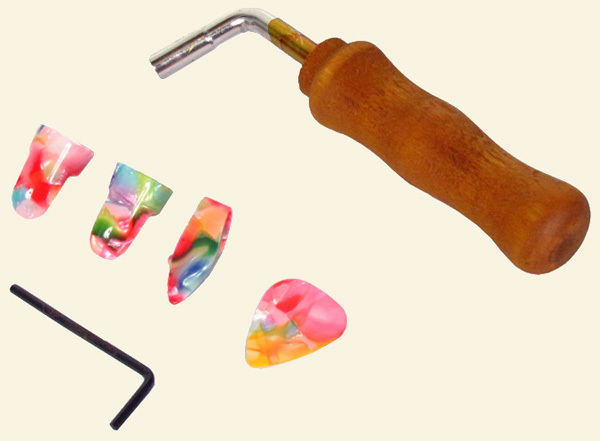 We also have a variety of picks available that can be used for different functions. Autoharpstore.com is the premier online retailer of autoharps and autoharp accessories. We have technical support Monday through Friday from 9 am to 7 pm and Saturday from 9 am to 5 pm eastern time. You can reach us by phone, live chat, or by e-mail. Please feel free to contact us with any questions you may have." This AutoharpStore.com Exclusive features flame maple on the front with natural wood tones that are accentuated by the honey sunburst design. The gloss finish provides an added layer of protection to the autoharp, however, it does affect the tone slightly giving it a lower sound. 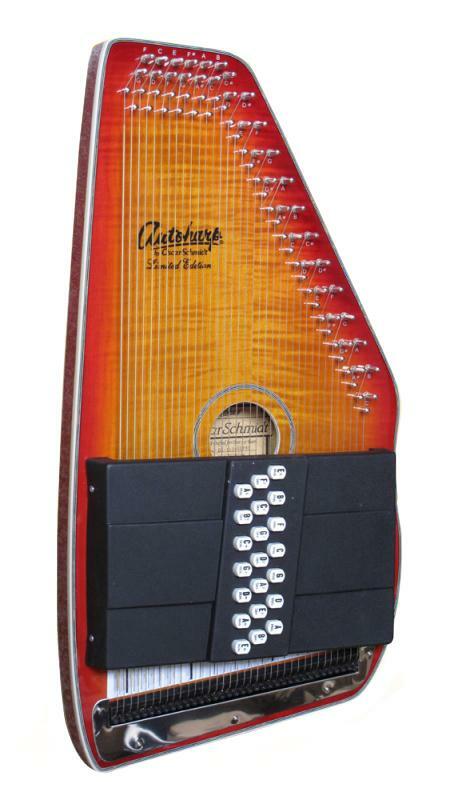 The back of the autoharp is made of solid spruce and also features the beautiful honey sunburst design. The secondary tuning system consists of tuning pegs that can be adjusted with an Allen wrench at the bottom of the autoharp. This allows professionals to adjust the tension of the strings by a significant amount providing a more refined sound. The pin blocks in many of the finest autoharps consist of hard rock maple for extra strength. The pin blocks are laminated 10-ply, rock maple pin blocks meaning they are specially coated for extra strength. The purpose of the pin block is to firmly hold the tuning pins in place where the strings are attached. The added strength of the laminated rock maple ensures that everything will stay in the right place. The Autoharp, like the piano, is a tempered scale, so the same string is used in several chords; even when perfectly in-tune in one chord it may sound slightly sharp or flat in another. Over time as the strings loosen, use fine tuning to tighten them so the strings can reach their limits. The first twang of a string is higher and the tone settles in after a second. Turn the tuner to 442 and attach the clip to the middle peg.